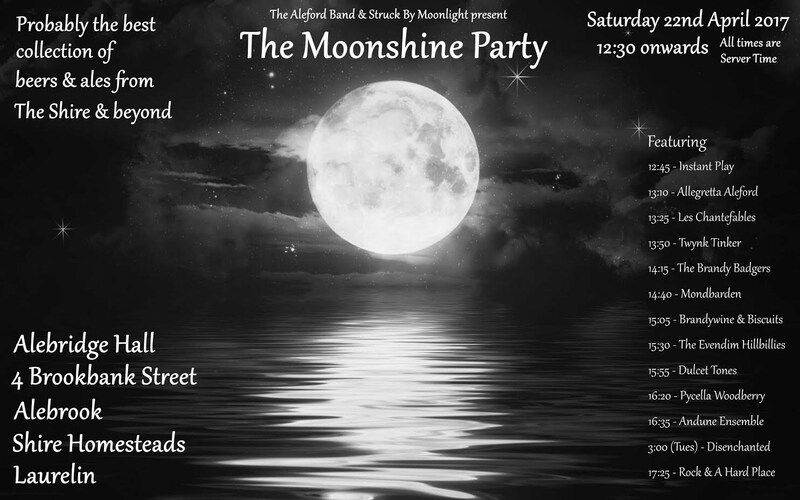 Aleford Band & Struck by Moonlight present: The Moonshine Party! Ed. : In the picture above you find the schedule of the Moonshine Party on April 22nd. Unfortunately, another clock than the usual one was used, so we ask you, our intelligent readers, to work out the proper Shire time yourselves. It is not that hard, just add 5 hours to what it says if you live in the section that is indicated by the letters "UK". Loyal readers who live elsewhere, probably know how to calculate their own clocktime. Just add or subtract the hours as you usually do.